Pinterest has put some extra power into its buyable pins, today introducing price drops in their latest update for mobile to help alert users when that object they’ve been coveting on their pinboard has finally gone on sale. 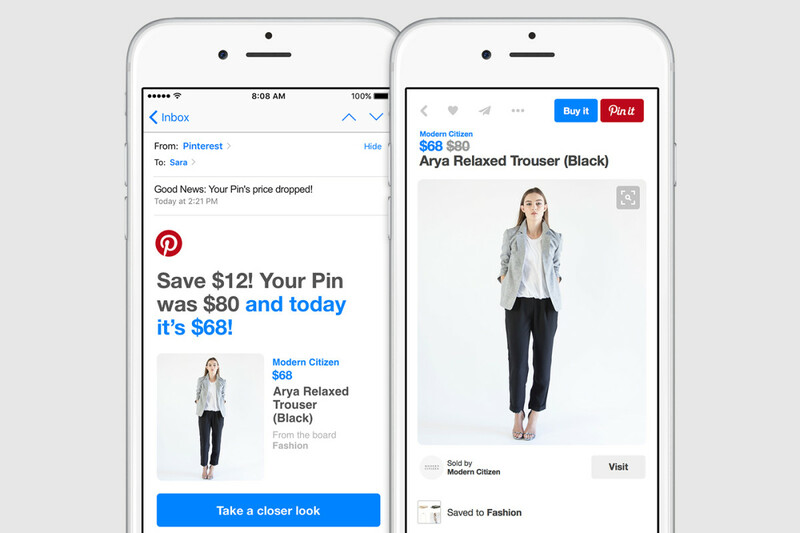 Once something you want to purchase — like a great new sweater — drops in price, Pinterest will send an email notifying you of the price differential. From there, you can buy that snazzy sweater right from within the platform. According to the company, more than 10,000 brands are shoppable from within Pinterest, including Nordstrom, Neiman Marcus and Kate Spade. Users can pay via credit card or Apple Pay to make purchasing items as simple as possible. With 87% active Pinners telling the company that they use the platform to decide what they should buy, it seems like a little sale alert to push them over the edge will invite more to take the plunge and hand over their credit cards. Price-dropped pins are available now in the latest update of Pinterest for iOS and Android.